As soon as that guy finishes taking my picture I'm going to spit this thing out! YUCK! Well, that looks like a mouthfull to me !! Obviously an astute and successful hunter !! Fine shot too ! You sure got a lot of good shots at Springerville--all one wildlife area. This is great. Love its frowsy topknot. 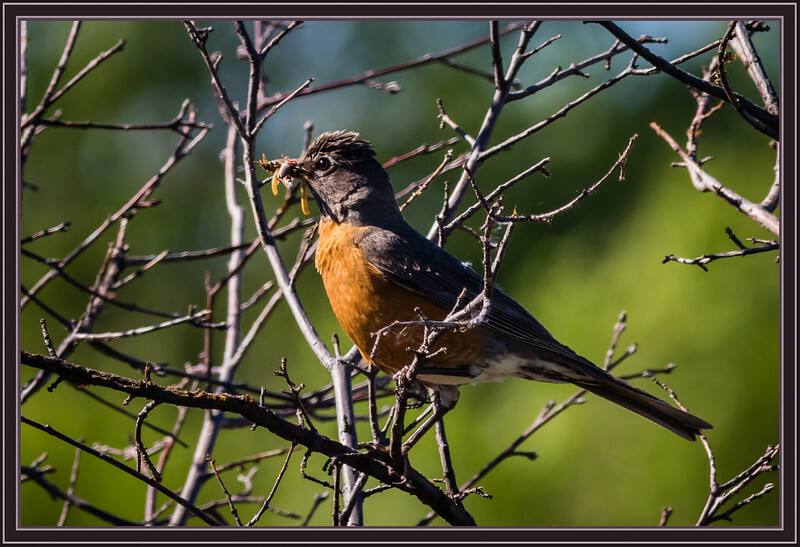 My first recollection of observing bird behavior, as a child, was watching robins pull earthworms up out of our yard. They do love their squirmy wiggly snacks. Very nice shot of the Robin. I like the tangle of branches and the light is outstanding. Beautiful shot. Great light and detail. Particularly like the food in the beak.